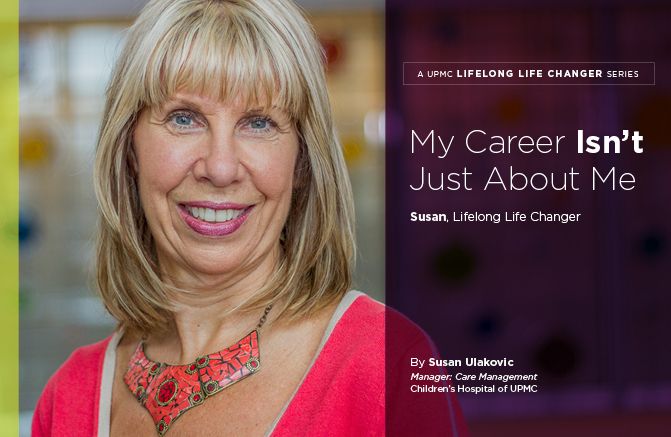 My name is Susan Ulakovic, and I’m a UPMC Lifelong Life Changer. My career at UPMC has been quite rewarding. I wouldn’t trade it for anything! Although I graduated from Shadyside Hospital Diploma School of Nursing, I worked at another health care organization for a short period before having my first child and returning to my alma mater in 1982. I worked part-time on the post-partum-gynecologic surgical unit and had two more children over the next four years before I accepted a full-time position to support my passion for obstetrics (OB) nursing. That position led me to become an active member of a work group that designed and implemented a labor, delivery, post-partum, and recovery (LDRP) unit at Shadyside Hospital, the first of its kind in this area. It’s a wonderful concept that physicians, staff, and — most of all — patients love. The LDRP project was quite motivating and opened up additional opportunities for me, such as teaching sibling classes, developing birth plans with expectant parents, and the eventual position of OB clinician and charge nurse. I remained in the OB clinician role at Shadyside Hospital, which later became UPMC Shadyside, until the LDRP unit closed and OB services were moved to Magee-Womens Hospital of UPMC. At some point during those two decades of my career, I went back to school for my BSN and then on to graduate school for my MBA. My oncology experience gave me a greater sense of compassion for all humankind, and I am grateful. We have all heard the saying “when one door closes another one opens,” and that proved to be no different for me. When UPMC Shadyside’s LDRP unit closed, I was offered a position on the care management team there, where I developed another passion — working with oncology patients. I loved how these patients didn’t sweat the small stuff and were grateful for even the smallest acts of kindness. I learned so much from these pillars of strength and have many memories — some that are overwhelmingly joyful and, of course, some that are overwhelmingly sad. My oncology experience gave me a greater sense of compassion for all humankind, and I am grateful. The purpose of pursuing my graduate degree was to eventually advance my career to a leadership role, so when the opportunity presented itself at Children’s Hospital of Pittsburgh of UPMC, I was ready. It’s hard to believe that I have been the manager of Children’s Hospital’s clinical care coordination for almost two years now. The staff and administration are wonderful, and I am fortunate. I strive to support Children’s Hospital’s care management team in reaching its full potential, and we are getting closer to that goal every day! While leaving the bedside was a difficult transition, my new role as a leader offers me challenges and personal satisfaction on a different level. I value the leadership training that UPMC provided for me and consider Children’s Hospital president Chris Gessner’s words, “It’s no longer about you,” to be my guide in keeping grounded. I strive to support Children’s Hospital’s care management team in reaching its full potential, and we are getting closer to that goal every day! I have been blessed with many opportunities to develop lifelong relationships with patients, co-workers, and leaders and will continue to build more with each coming day. They say if you love what you do, it will never feel like work — and they are right! My more than 35 years with UPMC have been the best, and while I know the road will eventually come to an end, I am hopeful that it’s a long one with few detours to navigate and lots of scenic views to experience. I have been blessed with many opportunities to develop lifelong relationships with patients, co-workers, and leaders and will continue to build more with each coming day. They say if you love what you do, it will never feel like work — and they are right!